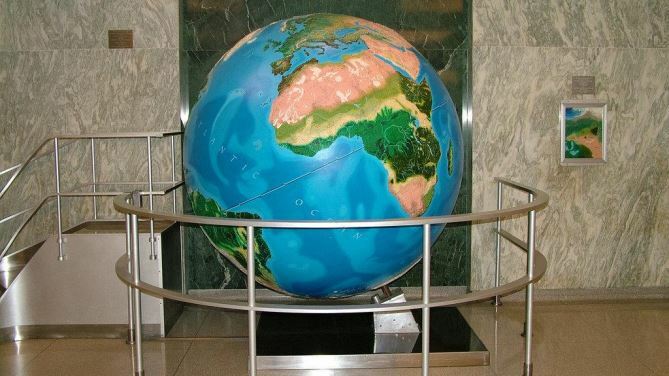 The globe on display at Ballantine Hall in Indiana University-Bloomington. A: The study examines the dynamic between geography and area studies through their distinct understandings of space. As I argue, the dominance of the regional concept in geography, which took the multiple ways of bounding space as its central problematic, was reduced in area studies rendering of global space. This study assesses the transformation of geography during the two decades before and after the Second World War. This era was one of contrasts. On the one hand, geography was central to the war effort and in the creation of post-war programs, most notably area studies. On the other, this era also marked the relative marginalization of geography as a discipline in higher education. Q: What are the practical, day to day, implications of your study? A: This study’s practical implications allow for a better understanding of space in all its multiplicity. It also shows how broader politics shape geographical knowledge of the world. Furthermore, the development of geography discussed in the article provides an important historical context for understanding geography’s contemporary relevance and status in American education and policy making. A: This study relates to two sets of recent scholarship. First, the study contributes to work calling for a renewed interaction between geography and area studies. By providing a historical account of their interface this study suggests new ways that both fields can engage which each other. Second, the study contributes to scholarship on the history of the discipline of geography, particularly as it was shaped by educational demands and institutional transformations during the Second World War and Cold War. A: This study’s theoretical implications involve new ways of thinking about space and world regions in light of the relationship between geography and area studies. First, it narrates how the regional concept was transformed into ‘area,’ in which space was reduced to the territories of nation-states and Cold War regional blocs. Second, the study underscores how geography and area studies can learn from each other, with area studies engaging with geography’s interest in the dynamics of nature, politics, and society, while geography can engage with the transformative role of postcolonial theory in area studies. A: This research helps us think about the development of geography within the broader ambit of the social sciences and politics during the Second World War and Cold War. It also helps to think about the implications of which concepts of space underwrite geography and the social sciences.